Want Total Privacy But Be Minutes from Downtown Asheville? Looking for a TOTALLY secluded hideaway in a mountain setting, yet minutes from the charming towns of Asheville and Weaverville? 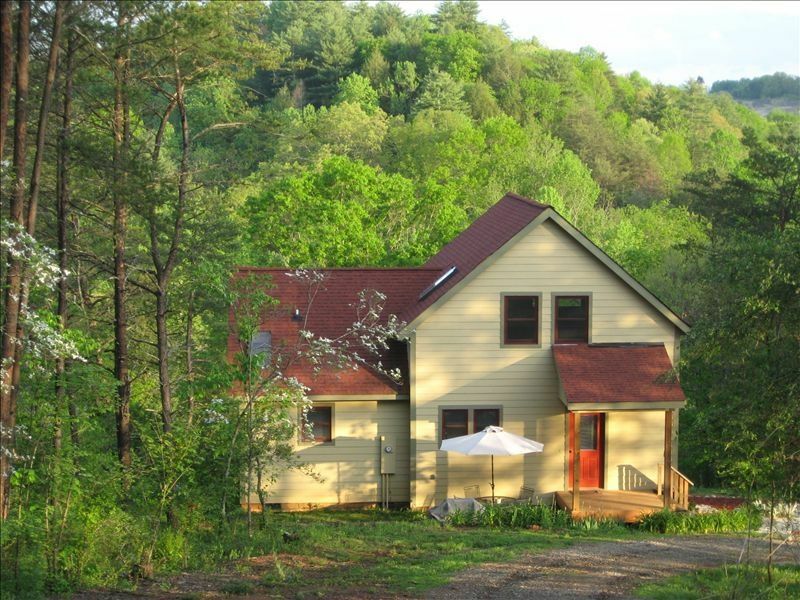 This cottage has everything you need for a romantic get-away or a home-base for exploring the beautiful Appalachian mountains. If you're an outdoor enthusiast, kayaking and mountain biking are but minutes from your front door. Want to unwind from it all? Then step out onto the deck where you can relax in your private hot tub while taking in the beautiful views. Use our home as a base from which to explore the wonderful sights, sounds and tastes of downtown Asheville. If you prefer, enjoy the provided books on the comfy sofa in the living room area, or relax upstairs in the loft/den. TV enthusiast? Enjoy the 42''FLAT SCREEN HI-DEF TV while reclining in the new recliners. With 3 acres of woods, the serenity of the area is perfect for a retreat from the routine of daily life. We provide all the necessary amenities to make your stay as enjoyable as possible, and then some! Maps, menus, and written directions make it easy to find all the restaurants, shopping areas, and attractions you may want to take in during your visit. Games such as Scrabble and Trivial Pursuit bring fun and entertainment to the day or night. And speaking of night, enjoy a complimentary bottle of champagne while relaxing on the covered porch as you star-gaze or listen to the peaceful sounds of the French Broad River. Or enjoy a camp fire in the fire pit (wood provided). Our cottage is equipped with central air conditioning for the warmer days of the year, as well as ceiling fans for those times when a cool breeze would be perfect. Thanks to skylights in the loft and bathroom (yes, bathroom! ), there's always a feeling of warmth and sunshine throughout. Don't want to leave your pets behind? Then bring them with you! They'll love exploring the surrounding woods. There is even a wooded dog park less than two miles from the cottage. We know you'll come to understand and appreciate the comfort of our cottage. We truly want to make your vacation special in every way. NOTE: PLEASE KNOW THAT THE ROAD TO THE COTTAGE IS GRAVEL. YOU MUST HAVE FRONT-WHEEL, FOUR -WHEEL, OR ALL-WHEEL DRIVE TO REACH THE COTTAGE. THIS IS A TOTALLY NON-SMOKING COTTAGE. NO SMOKING IS ALLOWED INSIDE OR OUTSIDE. Kerry is a local design/builder who put her talents to work creating Mountainside Cottage. She incorporated her love of light and simplicity to create a place that is warm and inviting. Susan lends her talents as the former owner of one of the Southeast's most successful bed and breakfasts, making sure that this cottage has everything necessary to make a traveler feel at home. Having lived in the Asheville area for 20 years, we have a deep love and respect for the natural environment as well as the cultural opportunities found in this region of the Appalachian mountains. When the 3 private acres adjacent to our 15 acres became available, we knew that would be the perfect place to build a vacation home for our extended families. As they are scattered around the world, it was important for us to offer a place that was near by, but afforded them the privacy they need and deserve. We soon realized this would also be a great place to offer as a vacation rental. In this busy world, this is a unique opportunity to experience TOTAL privacy. One of the things we love about the cottage is sitting on the covered deck, looking out into the woods, and listening to the sounds of nature. It's also great to drive into Weaverville, about 5 minutes away, grab a pastry or two at the world's BEST bakery, and come back and relax on the patio or in the hot tub on the deck. 42' FLAT SCREEN HI-DEF TV!! Over 150 channels from which to choose! totally secluded, within sight of no one! Immaculate private home for a quiet getaway! The home was exactly what we were looking for! It was extremely private, yet downtown Asheville was easily accessible. Everything was very clean and comfortable, lacking none of the necessities. The hot tub on the back porch was wonderful to enjoy at the end of the day. There's a great park on the river less than 2 miles away, which was perfect for walking our dogs. The home is very dog-friendly, which was a huge plus! We didn't want to leave and would absolutely rent this property again in the future. Spacious with tall ceilings in the large main room and relaxing hot tub. It is private but only a few minutes from Weaverville, 15-20 min to Asheville. Furniture very comfortable. Very clean and feels like new. Children might enjoy sleeping in the loft where there is a futon. We were there when there was a lot of rain so road a bit muddy as were our hiking boots! A place to clean these off before entering the house would be great! Highly recommend but agree that AWD or 4WD important for the dirt/gravel road up to the property. We had an amazing time! I was worried about the driveway based on other reviews but our AWD did just fine. Location is amazing and the house had every thing you could need and more. You can tell Susan is extremely detail oriented when you see her big notebook of restaurants, hikes, and directions. We will absolutely be back! This was our second stay in this cabin- and everything was once again perfect! It is such a short drive to most things around Asheville, but when you get back to the cabin there is complete privacy. The hot tub feels great after a long day of hiking. The kitchen is equipped with everything you need for meals. We could have slept for days in that bed! Everything is always so clean, and Susan is so accommodating and quick to respond! We will definitely be coming back year after year as long as this property is available to us! And it was great to have you back!! I can't tell you how much we appreciate how you take care of the cottage. We know it's in good hands when you're here! And we would love to have you both back--year after year! Very much enjoyed my recent stay at your property. My sister and I were in town to see the Chihuly Nights Exhibit at the Biltmore Estate. The property has everything one would want or need for a relaxing and rejuvenating retreat. Very clean and comfortable. And of course there is the HOT Tub ( AHHHHHH) ! Also my Toyota Rav 4 did well on the Trek up the mountain. Look forward to coming back....wouldn't mind getting stuck in a snow storm-again there is a HOT TUB! Very impressed with how clean and organized everything was in the cabin. Everything appears updated. Comfortable bed, big bathroom and shower, and a well stocked kitchen. Hot tub was a plus, just wish the weather had been a bit cooler. One watch out...we did need to put our truck on 4WD to get up the hill. Not sure we would have made it in a normal car. Overall, would highly recommend if you are looking for a clean, comfortable cabin near Asheville. $125 refundable security deposit required upon making reservations. $40 pet fee required. $15/night for extra person (beyond 2). House rules will be sent upon inquiry.